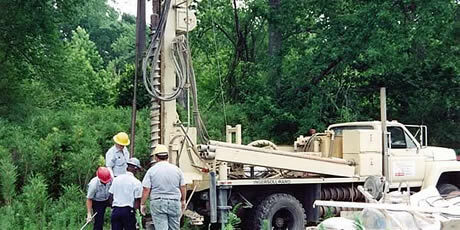 Drilling - Terraquest Environmental Consultants, P.C. Terraquest Environmental Consultants, P.C. owns a Geoprobe 7822DT direct push / auger rig that can be used to conduct soil and groundwater investigations. The 7822DT is mounted on tracks and is capable of working on a variety of terrains and in areas with limited access given the small size of the unit. Direct push capability allows rapid collection of soil and groundwater samples with minimal site impact and at much lower cost than conventional drilling techniques. The 7822DT also has solid and hollow-stem auger capability for the installation of groundwater monitoring wells. Having in-house direct push and drilling capabilities allows Terraquest to be very cost-competitive and responsive to client deadlines. When bedrock or competent material is encountered, Terraquest utilizes a network of subcontractors capable of air rotary, air hammer, or mud rotary drilling. All drilling work is performed by appropriately trained and licensed drillers. For additional information regarding the capabilities of the Geoprobe, please contact us.